by Montagu Mail ~ One bird watcher of note recently visited Montagu and made a list of all the birds he saw here in just a few hours a day for less than a week. It came to 56, and who knows how many more he would have seen had he been able to stay longer! Montagu's treasure of bird life has been amply confirmed. 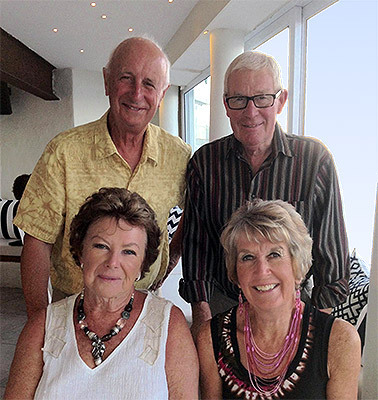 Professor Robin Doughty visited the town with his partner, Barbara Porter for a week in December. He is Professor Emeritus of Geography and the Environment at the University of Texas in the USA. Barbara Porter is the life-long friend of Montagu swallow Judith Stamper, and the visit was mainly social. But the professor is wild about birds and he took advantage of the time here to indulge his passion. Much of his watching time was centered at the Montagu Nature Garden, and thanks to Curator Hugo de Wet who made a special effort, he was able to get in on most days well before the opening time. Professor Doughty is a man of considerable intellectual muscle and authority. He has written a number of books, basically on man's impact on the world's other animals, including one on the feather trade and the origins of bird protection; others on the recovery of the endangered whooping crane; the mockingbird as Texas 'state bird'; the impact of early settlers on wildlife in the Lone Star State; and a recently completed manuscript on conserving the albatross from losses due to long-lining. Judith Stamper and Barbara Porter met more than 66 years ago when, at the age of 4, they were at kindergarten together in Burnley, Lancashire. They have been best friends ever since.